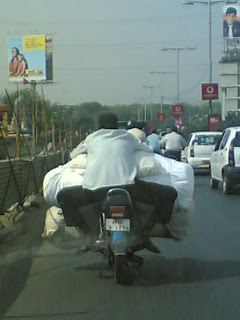 This post is an eye-opener to all the stunt bikers who think they are the only dare devils. There are others too who have breathtaking talent. I happened to go out with my colleague for a meeting. I avoided my bike and we decided to go by car as the temperatures were soaring high. As we were moving through the Greenland flyover, we spotted an unusual vehicle. At first sight, it took me a few moments to recognise the type of vehicle that just zipped by. With eyes wide open I was trying to grasp the fact that it was a bike. I asked my colleague to follow the biker so as I can understand what exactly that entity was. 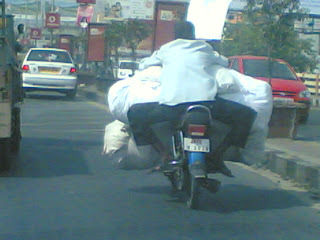 One thin that we noticed about the vehicle was that it was fully overloaded. I have no words to explain how the vehicle was put to test and loaded in such a way that its appearance was deceptive. It seemed to be a perfect transformation of the bike from an absolute case of malnutrition to a fat beast. 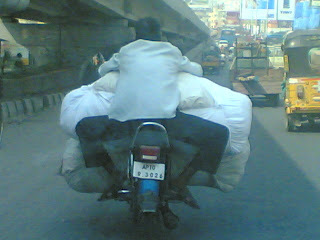 The bike was loaded in such a way that its appeared HUGE. I suggest you see it with your own eyes. A word about the biker, "over skilled". 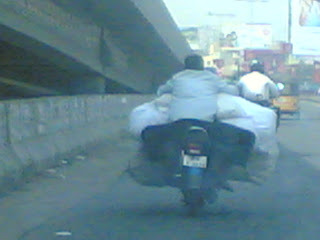 Hats off to the rider who was managing the vehicle with such an ease. It seemed to be a cake walk through the busy dense traffic. I wonder how he was controlling the stuff. He proved to be a show stopper as everyone whom he overtook was looking at him with dilated pupils even in the brightness of scotching afternoon. 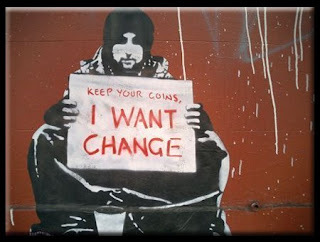 The only thing constant in this world is change. No matter, how much global or local in its outlook, every organisation encounters Change. No organisation can escape it. Adopting Change Governance is the need of the hour..
CHANGE CAN BE triggered by various external factors or forces like Globalization, Compliance to Regulations, mergers and acquisitions and pressures due to competition. In today’s business and enterprise world, factors initiating change are ambivalent. They enforce conditions leading to consumption of time, money and resources, in addition to increasing risk and also pose a challenge to the business operations. Even a minute change can grow and make an impact over a whole enterprise and can have unexpected consequences. Organisations or businesses must always be on their toes to foresee change. If an organisation is aware of the onset of change and is well prepared to anticipate and channel its potentially destructive energy, they can capitalize on the change through ways that can transform their businesses. That poses a pertinent question that needs to be answered. How can an organisation foresee change and take advantage. In today’s distributed enterprise where the impact of a single minute change occurring in one of the modules of the organisation can have a significant impact on the organisation as a whole? The wider impact of any change, and its subsequent management, is not appreciated until it is too late. With the result other parts of the organisation find themselves unexpectedly caught off guard by changes that had their first impact elsewhere in the enterprise. Considered to be a constant entity, Change is a part of business environment that confronts modern enterprises at all times, on every front. Every company deals with change on its own terms and has its own unique way of dealing with the change. How it responds determines the final critical difference between costly miss or translating an advantage out from it. Company that have inbuilt strategy meant for monitoring and controlling change will have a much greater chance of success. On the other hand, an enterprise lacking strategy will assume the change to be an unavoidable and unnecessary risk without really doing anything about that. Broadly termed, companies operate at different maturity levels when dealing with change across their IT organizations. They either overreact and suffer loss or use calm heads and profit from it at the other. Change is omnipresent and pervasive in competitive markets. There are many issues and aspects related to change that are debated the most in business like the necessity of change, factors driving change, its value and so on, but in reality, the impact of change is often negative. Triggered, enforced and endorsed by the increasingly complex nature of the enterprise and evolving change events that present new and unique challenges to today’s enterprises, change is happening faster than ever. Changes such as growth and best practice implementation are termed as beneficial changes. Even these can interrupt the flow of business and strain company resources. While responding to the forces driving change, the companies may find that the way in which they respond may in turn fuel more change. Change comes from many directions. Responding to external change requires internal change, which is a period of adjustment, acceptance and transition. Change events impact an organisation from all directions and become themselves a catalyst for yet more change. Generally companies see change as a threat instead of an opportunity. But controlling change proactively, instead of reacting to it defensively, can make all the difference. Change can have a catastrophic impact or transformative benefit. While change can be effectively managed within a given parameter, the lack of understanding of its broader implications can expose the entire organisation to a negative outcome. In today’s global, distributed enterprise, change often starts in silos. These silos may occur within business units, geographies, job roles, and even individual technologies. While a specific change event may be contained and managed within a silo, the common frame of reference that enables the company to see the impact of the change outside the silo, or to integrate the change with other activities outside the silo, is missing. If an organization approaches change in isolation, serious and damaging consequences may follow. Companies which are unable to adequately foresee or anticipate change are forced to reach to it. They realize the impact most after the effects have filtered through the organisation and expensive cleanup is required. Downtime can cost companies millions per hour. Also a downturn in quality can badly hit an organization and eat away the customer base. Exposure to uncontrolled costs, excessive risk, and poor quality can also lead to missed revenue opportunities or even spell financial disaster. Change is never easy, and its effects can be far-reaching and little understood in a large organisation. Trying to minimize the impact of change is therefore a common mind-set which is ultimately futile. Change ripples outwards from its epicenter with effects beyond its immediate impact. Even if change is anticipated by some, its consequences will be felt by many who, not being at the site of the initial change event, are unprepared to deal with it. Change therefore must be approached holistically, by the whole organisation, not in departmental or functional silos. Rather than reacting and trying to limit the impact of change, Change Governance is an approach that seeks to understand change as it ripples across the organisation and in doing so harness its power for business advantage. The idea of governance itself involves a change in mindset. Change Governance is an approach to integrating and coordinating the development, implementation, and adoption of enterprise-wide policies and processes so that organizations can successfully embrace change and handle it in a way that results in a successful business outcome. Change Governance is an effective response to the change that mitigates the risks and reduces the costs associated with not having a proactive, defined and coordinated means of managing change events. It allows organisations to envision the impact of a change before it happens, devise an effective organizational response to it and put into effect consistent change processes and policies across the business. Unlike traditional change management approaches, Change Governance effectively bridges “silos of change” within the enterprise and creates a common frame of reference for business and IT. As a result, IT is better positioned to deliver strategic value to the business. There are three key steps which have to be taken if organizations are to move towards Change Governance. The first step involves providing the organizations with tools and techniques to better understand change before it strikes or has an impact over them. It involves a thorough review of the potential change that is going to be made and have an understanding before implementation whether it is harmful or beneficial for the enterprise. The second thing to do is to have a process for coordinating the dialogue across the organisation. And the third step is to ensure that once the organisation is set to implement the policy, it should actually do so. This involves visualising the change upfront, orchestrating the implementation and ensuring that it is complied with. Orchestrate change: Translate that understanding into effective change policies and processes. Enforce change: Drive adoption of change policies and processes across the enterprise to ensure changes are efficient, consistent, and successful. A good Change Governance solution can remove the risk of change and turn change events into business advantages such as improved business practices, increased profitability, competitive advantages, and more. Software Change Management is a subset of Change Governance. While SCM products may be appropriate for managing change as a discrete project within “silos” such as business units, geographies, job roles, specific platforms, Change Governance solutions enable companies to holistically view, integrate, and control change across the entire enterprise. Change management is complicated, yet for most enterprises, it is business as usual. Budgets, processes, and personnel are commonly tied to separate solutions in isolated departments. Change management typically happens within these “silos,” and complexity often increases as processes and agendas conflict. It also tends to be an IT-driven activity and can miss opportunities to contribute to potential business benefits. Change Governance has a strategic approach as compared to the Software Change Management, enabling an organisation to control change consistently, efficiently, and successfully, eliminating the fear of disruption and negative outcomes. With the help of Change Governance a change is transformed from a threat to an opportunity becoming a strategic asset that can advance the business, improve profitability, and gain an advantage over companies that still react to change in an isolated or defensive manner. By approaching change as an integrated, enterprise-wide activity, Change Governance enables IT to deliver greater strategic value to the business. As a result, the high costs, poor quality, and excessive risks that often result from traditional methods of dealing with change are eliminated. Change management is very localized and particular, and change governance is more strategic, more comprehensive. There are a few companies that provide Change Governance solutions. These solutions are aimed at providing business and IT with a common frame of reference, helping them to think about the business benefits of a change, coordinate responses across change lifecycles and put into effect effective business processes to more effectively govern change. Companies all over the globe are adopting Change Governance which in turn is turning out to be a knight in shining armor for them.